My coworker and her husband loved them and after some initial hesitation so did the little girl. 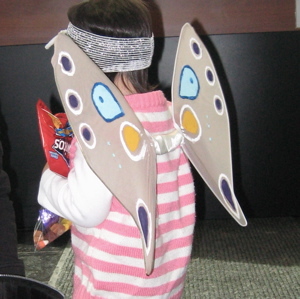 She stopped by the office to stock up on loot and show off her wings. lufah, beautiful yarns as always. I especially like Tropic of Cancer. I need to figure out how to spin bamboo more smoothly. Here's my one yarn for this week. Not terribly exciting but I'm very pleased with it because it was exactly what i was hoping for! 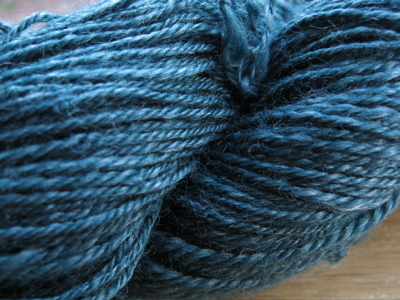 4 oz, 290 yards/265 meters, Merino/Tencell blend. It's about a DK/sport weight and it is "navajo"/chain plied. I have another 4 oz to spin and I'm hoping to get the same-ish results. Flowering Weeds, the June offering from Spunky Eclectic FOTM. 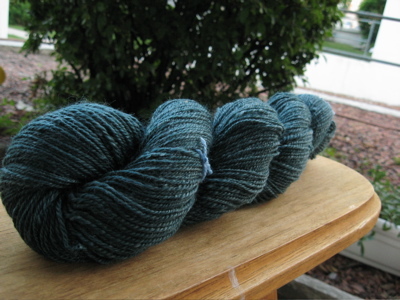 318 yards/291 meters, 3 oz, approximately a sock weight-ish. 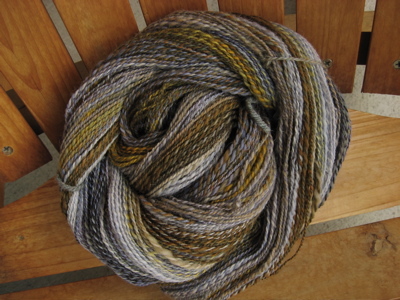 I could not seem to get a good picture of the colors in this yarn. 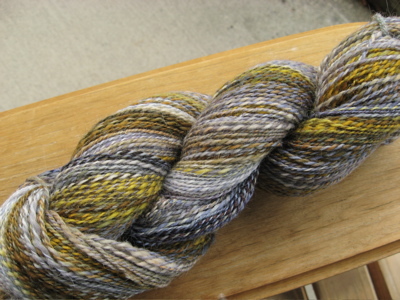 I spun it as it was in the roving and it has long stretches of purples, blues, browns, cream and yellow. I love it. Now I just need to decide what to make with it. 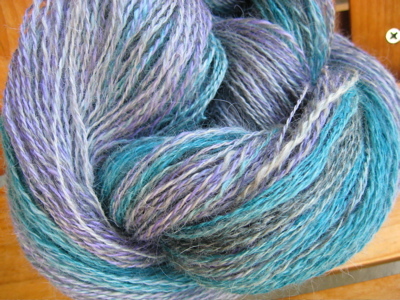 One of these times I'll have to branch out and try something more creative and spin an art yarn... one of these times. You guys are so inspiring! 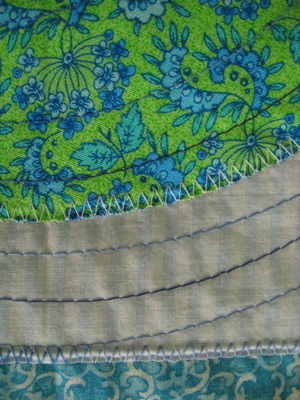 The squiggly end was a rather unsuccessful attempt to use my quilting foot. 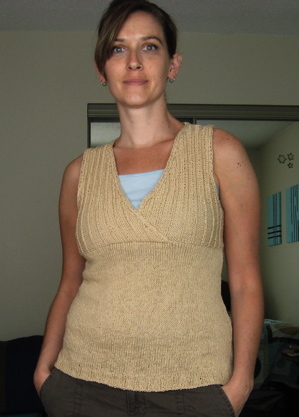 I finished a summer top before the first day of summer! This is an accomplishment for me, as I seem to usually start and set aside many many summer tops and never actually finish them. Sigh. Startitis, I guess. 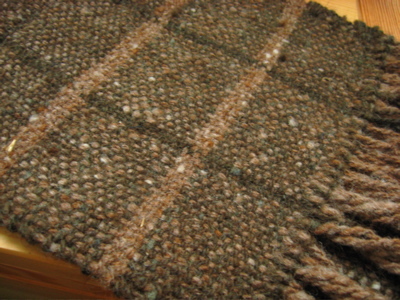 Yarn: recycled from a thrift store sweater. 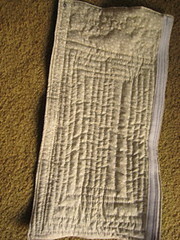 I have long since lost the tags, but I remember linen and cotton in the fiber makeup. I made this to work on my consistency and just to generally practice. I'm really happy with how it turned out. 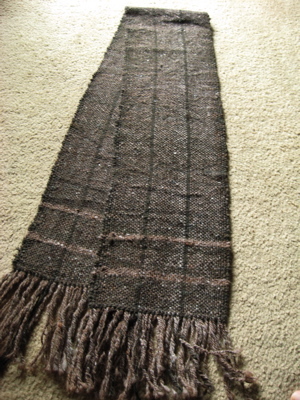 Both warp & weft are my handspun alpaca. I had dyed one batch a deep green before spinning. Everything is SO beautiful this week (as usual but... wow). Too many to begin listing off favorites. "The Perfect Storm" - April 2008 Spunky Eclectic FOTM 4 oz about 400 yards. Probably about a sock weight or so. 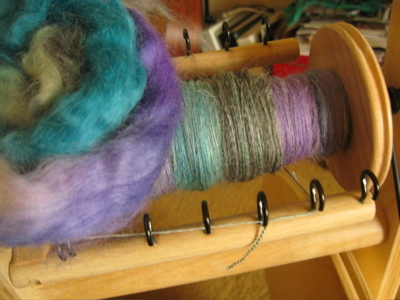 The colors were really intense and beautiful in the roving but really muted in spinning. I love how it turned out. Can you explain how you did the circles? 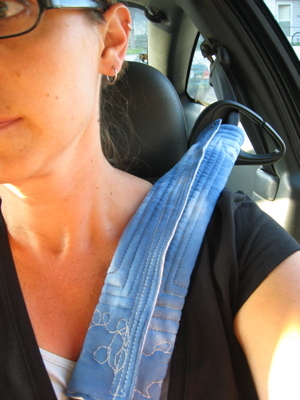 Did you just tuck the edges under and sew it on top? 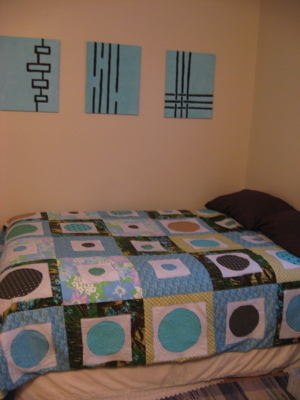 I used a lazy quick method to attach each circle to the light colored fabric squares, and then to attach the light colored fabric squares to the large squares. 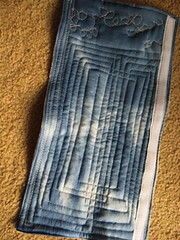 I just zig-zagged around the cut out piece and then went back after the pieces were attached to the large squares and quilted each one in a spiral. This is the biggest thing I have EVER made! I'm really happy with it. 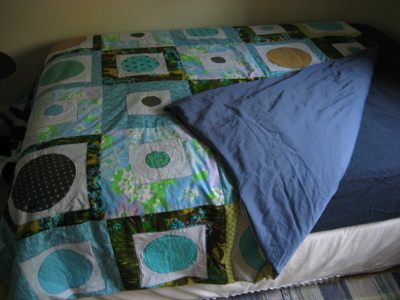 The top of the duvet cover is backed with a sheet and quilted in the ditch. The back of the duvet cover is a 100% cotton sateen sheet. Fabrics for the top are all from stash (yay). 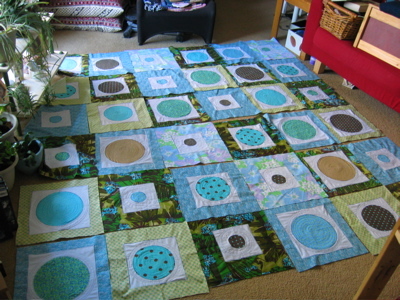 I had to sit on the top as I pieced it to pin the next row. We're about to get another blizzard (it just started snowing) which may be the only thing preventing me from going loom shopping tomorrow. I want a "real" one!! I have so many ideas that need to get woven!